The speed of sound is the distance travelled per unit time by a sound wave as it propagates through an elastic medium. At 20 °C (68 °F), the speed of sound in air is about 343 meters per second, or a kilometre in 2.9 s or a mile in 4.7 s. It depends strongly on temperature, but also varies by several meters per second, depending on which gases exist in the medium through which a soundwave is propagating. In fluid dynamics, the Mach number is a dimensionless quantity representing the ratio of flow velocity past a boundary to the local speed of sound. A ducted fan is air moving arrangement whereby a mechanical fan, which is a type of propeller, is mounted within a cylindrical shroud or duct. The duct reduces losses in thrust from the tips of the propeller blades, and varying the cross-section of the duct allows the designer to advantageously affect the velocity and pressure of the airflow according to Bernoulli's principle. Ducted fan propulsion is used in aircraft, airships, airboats, hovercraft and fan packs. Altitude or height is defined based on the context in which it is used. As a general definition, altitude is a distance measurement, usually in the vertical or "up" direction, between a reference datum and a point or object. The reference datum also often varies according to the context. 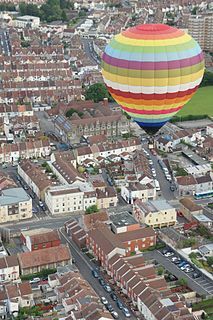 Although the term altitude is commonly used to mean the height above sea level of a location, in geography the term elevation is often preferred for this usage. The wingspan of a bird or an airplane is the distance from one wingtip to the other wingtip. For example, the Boeing 777-200 has a wingspan of 60.93 metres, and a wandering albatross caught in 1965 had a wingspan of 3.63 metres, the official record for a living bird. The term wingspan, more technically extent, is also used for other winged animals such as pterosaurs, bats, insects, etc., and other fixed-wing aircraft such as ornithopters. In humans, the term wingspan also refers to the arm span, which is distance between the length from one end of an individual's arms to the other when raised parallel to the ground at shoulder height at a 90º angle. Former professional basketball player Manute Bol stands at 7 ft 7 in (2.31 m) and owns one of the largest wingspans at 8 ft 6 in (2.59 m). A fluid flowing past the surface of a body exerts a force on it. Lift is the component of this force that is perpendicular to the oncoming flow direction. It contrasts with the drag force, which is the component of the force parallel to the flow direction. Lift conventionally acts in an upward direction in order to counter the force of gravity, but it can act in any direction at right angles to the flow. In aeronautics, a chord is the imaginary straight line joining the leading and trailing edges of an aerofoil. The chord length is the distance between the trailing edge and the point on the leading edge where the chord intersects the leading edge. In fluid dynamics, drag is a force acting opposite to the relative motion of any object moving with respect to a surrounding fluid. This can exist between two fluid layers or a fluid and a solid surface. Unlike other resistive forces, such as dry friction, which are nearly independent of velocity, drag forces depend on velocity. Drag force is proportional to the velocity for a laminar flow and the squared velocity for a turbulent flow. Even though the ultimate cause of a drag is viscous friction, the turbulent drag is independent of viscosity. The drag of a wing consists of two components, the induced drag, which is related to the production of lift, and the profile drag, largely due to skin friction which is contributed to by the whole wing area. It is therefore desirable for a wing to have the least area compatible with the desired lift characteristics. This is best achieved with a high aspect ratio, and high-performance types often have this kind of wing. At speeds above the critical Mach number, the airflow begins to become transonic, with local airflow in some places causing small sonic shock waves to form. This soon leads to the shock stall, causing a rapid increase in drag. The wings of fast subsonic craft such as jet airliners tend to be swept in order to delay the onset of these shock waves. Supersonic travel is a rate of travel of an object that exceeds the speed of sound (Mach 1). For objects traveling in dry air of a temperature of 20 °C (68 °F) at sea level, this speed is approximately 344 m/s, 1,125 ft/s, 768 mph, 667 knots, or 1,235 km/h. Speeds greater than five times the speed of sound (Mach 5) are often referred to as hypersonic. Flights during which only some parts of the air surrounding an object, such as the ends of rotor blades, reach supersonic speeds are called transonic. This occurs typically somewhere between Mach 0.8 and Mach 1.2. A flying wing is a tailless fixed-wing aircraft that has no definite fuselage. The crew, payload, fuel, and equipment are typically housed inside the main wing structure, although a flying wing may have various small protuberances such as pods, nacelles, blisters, booms, or vertical stabilizers. In aeronautics, wave drag is a component of the aerodynamic drag on aircraft wings and fuselage, propeller blade tips and projectiles moving at transonic and supersonic speeds, due to the presence of shock waves. Wave drag is independent of viscous effects, and tends to present itself as a sudden and dramatic increase in drag as the vehicle increases speed to the Critical Mach number. It is the sudden and dramatic rise of wave drag that leads to the concept of a sound barrier. In aeronautics, the aspect ratio of a wing is the ratio of its span to its mean chord. It is equal to the square of the wingspan divided by the wing area. Thus, a long, narrow wing has a high aspect ratio, whereas a short, wide wing has a low aspect ratio. In aerodynamics, lift-induced drag, induced drag, vortex drag, or sometimes drag due to lift, is an aerodynamic drag force that occurs whenever a moving object redirects the airflow coming at it. This drag force occurs in airplanes due to wings or a lifting body redirecting air to cause lift and also in cars with airfoil wings that redirect air to cause a downforce. A T-tail is an empennage configuration in which the tailplane is mounted to the top of the fin. The arrangement looks like the capital letter T, hence the name. The T-tail differs from the standard configuration in which the tailplane is mounted to the fuselage at the base of the fin. In aerodynamics, the critical Mach number of an aircraft is the lowest Mach number at which the airflow over some point of the aircraft reaches the speed of sound, but does not exceed it. At the lower critical Mach number, airflow around the entire aircraft is subsonic. At the upper critical Mach number, airflow around the entire aircraft is supersonic. A supercritical airfoil is an airfoil designed primarily to delay the onset of wave drag in the transonic speed range. Supercritical airfoils are characterized by their flattened upper surface, highly cambered ("downward-curved") aft section, and larger leading-edge radius compared with NACA 6-series laminar airfoil shapes. Standard wing shapes are designed to create lower pressure over the top of the wing. The camber of the wing determines how much the air accelerates around the wing. As the speed of the aircraft approaches the speed of sound, the air accelerating around the wing reaches Mach 1 and shockwaves begin to form. The formation of these shockwaves causes wave drag. Supercritical airfoils are designed to minimize this effect by flattening the upper surface of the wing. In aerodynamics, pitch-up is a severe form of stall in an aircraft. It is directly related to inherent properties of all swept wings, and seen primarily on those platforms. Unlike conventional low-speed stalls, pitch-up can occur at any speed, and are especially dangerous when they take place in the transonic; at these speeds the aerodynamic loads can become so high as to break up the aircraft, as occurred in 1964 when a F-105 Thunderchief of the USAF Thunderbirds broke up in mid-air. It can also occur at low speeds, in which case it has been called a Sabre dance, a particularly dangerous behaviour of swept wings that became apparent during the development of the USAF F-100 Super Sabre. The wing configuration of a fixed-wing aircraft is its arrangement of lifting and related surfaces. A trapezoidal wing is a straight-edged and tapered wing planform. It may have any aspect ratio and may or may not be swept. A supersonic airfoil is a cross-section geometry designed to generate lift efficiently at supersonic speeds. 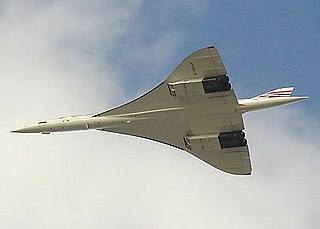 The need for such a design arises when an aircraft is required to operate consistently in the supersonic flight regime. Boeing Truss-Braced Wing are airliner designs studied by Boeing with braced, high aspect ratio wings. The crescent wing is a fixed-wing aircraft configuration in which a swept wing has a greater sweep angle on the inboard section than the outboard, giving the wing a crescent shape. In aeronautics, the thickness-to-chord ratio, sometimes simply chord ratio or thickness ratio, compares the maximum vertical thickness of a wing to its chord. It is a key measure of the performance of a wing planform when it is operating at transonic speeds. ↑ Clancy 2005 Page 232. ↑ Clancy 2005 Pages 84. ↑ Clancy 2005 Pages 65, 82. ↑ Clancy 2005 Page 279.